As more people turn to video for their information, the explainer video has secured its place among essential marketing tools. The rise of video is evident in the number of businesses incorporating it into their digital marketing strategies. 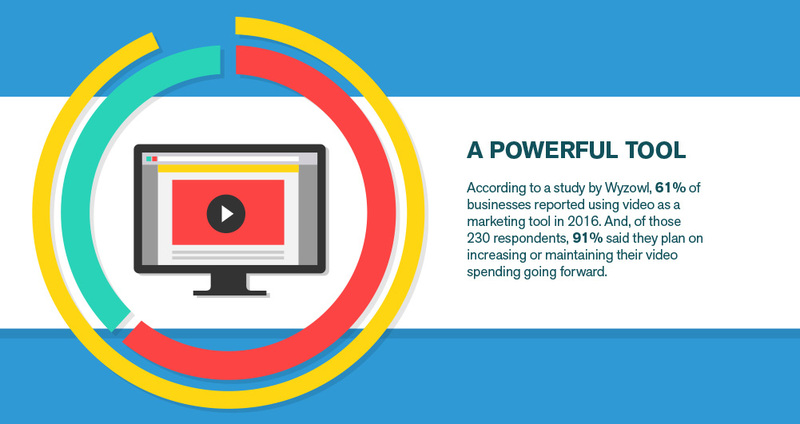 According to a study by Wyzowl, 61% of businesses reported using video as a marketing tool in 2016. And, of those 230 respondents, 91% said they plan on increasing or maintaining their video spending going forward. As a result, don’t ignore this powerful statistic, marketing across industries, is more competitive than ever. Explainer videos, simply put, are animated videos that communicate a company’s message in a short, concise way – with personality. Explainers can convey your message through creative storytelling; facilitating the use of visual metaphors to represent ideas that give the viewer a unique perspective on a story, product or service. And the best part? Explainer videos can even put a smile on your client’s face. Now, that’s powerful marketing. Unlike live shoots, explainer videos can take place anywhere – from Mars to your tech campus, without needing a crew present. Not only does this dramatically reduce cost and production time, but it also allows your world to get a lot bigger. 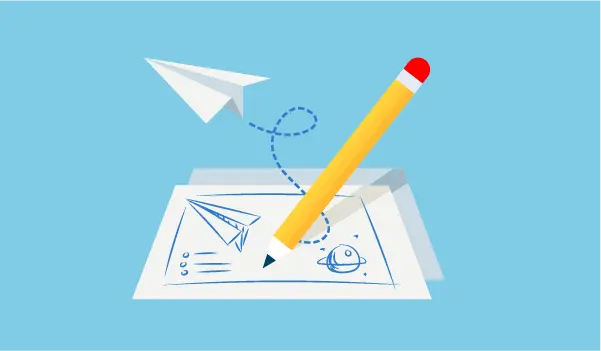 Communicating complex ideas through eye-catching motion design and a clear, compelling script is a simple way to connect with your clients. This idea has actually been proven through research. 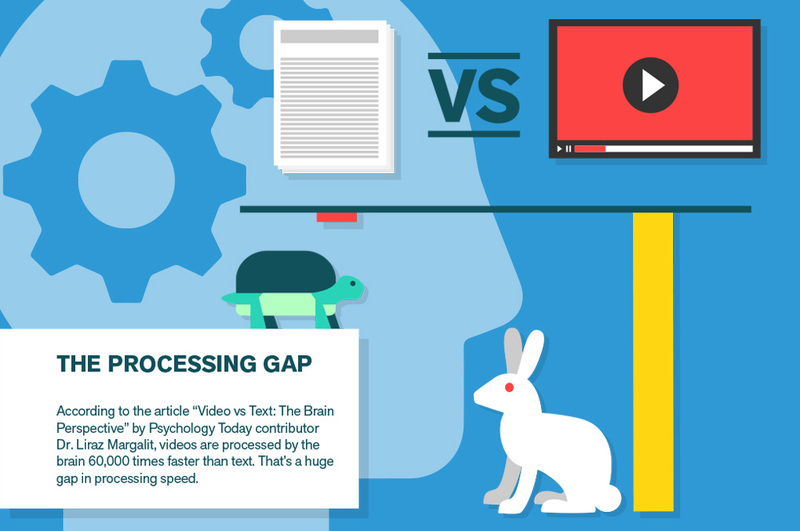 According to the article “Video vs Text: The Brain Perspective” by Psychology Today contributor Dr. Liraz Margalit, videos are processed by the brain 60,000 times faster than text. That’s a huge gap in processing speed. It’s the difference between riding your bike 20 miles and driving your car the same distance. Given that the human brain can exert a lot less energy watching a video than reading an article, it’s safe to assume that people are going to choose video. By delivering an immersive experience to your customer, they can focus on the benefits of your product. Conversely, introducing a new product or idea through text can sometimes be confusing. This is especially true of new technology or highly technical products. Dr. Margalit goes on to explain how video is better at producing emotion than words. In marketing terms, this makes video the golden goose. Pushing buttons is the fastest way to get people’s attention. If those buttons are happiness, curiosity, joy, excitement, and laughter, then you just hit the communication jackpot. Why Not Your Average Sales Pitch? First, a top-quality production company will always take your existing branding into consideration. This might mean creating all the assets for your animation from scratch using your branding guidelines to execute the overall aesthetic. Great motion artists can illustrate any idea from the absurd to the realistic. This might start with a hand drawn illustration that will then be transcribed digitally. Alternatively, there are some options for graphics that can be appropriated and given a facelift to represent your brand. Generally, using third party graphics is a more affordable solution. Sound designers can then create an original score or work with an in-house library. The goal is to create an animation that speaks in your brand voice and is unique to your organization. Either way, a pro-level outfit understands how to align your company’s branding with your video. The last thing you want is a low-quality video that cheapens your brand and raises questions in the minds of your audience. Regardless of who your audience is, people love to be entertained. If your product is the best CMS in all the land, your customer – whether they’re doctors or CEOs, will pay more attention to an entertaining video than a sea of words. A well-produced script and great design usually beats a salesperson giving an elevator pitch with some B-Roll mixed in. Don’t know what B-Roll is? Here’s a satirical video that describes what B-Roll is in a funny way. If not done right, people talking to the camera can be excruciatingly boring and provide no return on your marketing expenditure. The key is to keep your message simple and focus on customer benefits. After that, you can decide how you want to tell your story. At ES Creative, we begin by identifying your goals via a creative brief and then we have our writers craft exceptional scripts. In most cases, you will need to say everything in less than two minutes, so identifying your main selling points is essential. Most explainer videos fall into the 60- to 90-second range. They’re short enough to keep someone’s attention, but long enough to introduce your product. (And make a lasting first impression.) 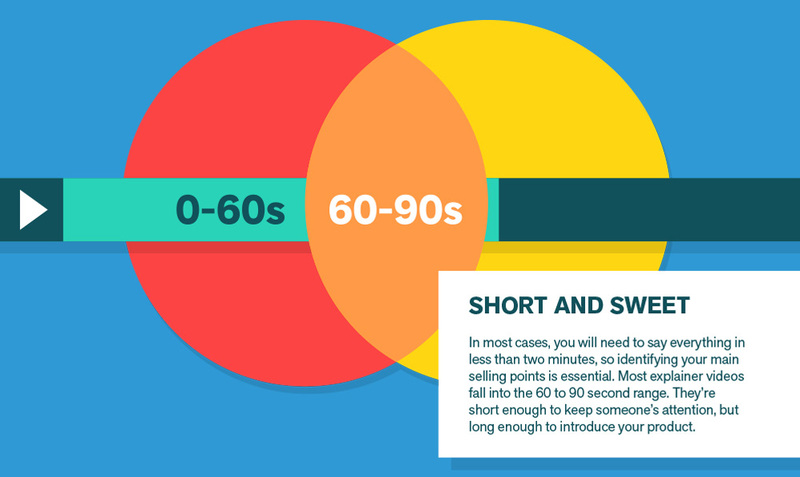 From our research, this is the sweet spot – so, the shorter the better! Our copywriters can clarify your message as succinctly as possible, explain your core services and express your unique selling points, without losing your viewer’s interest. We’ve worked with a broad spectrum of clients; some like to be a part of the brainstorming process, while others are hands-off. We’re here to work with you and have tools to guide this process along. Now for the fun part. Since explainers are made with Motion Graphics, the only restriction on what your audience will see is your imagination. 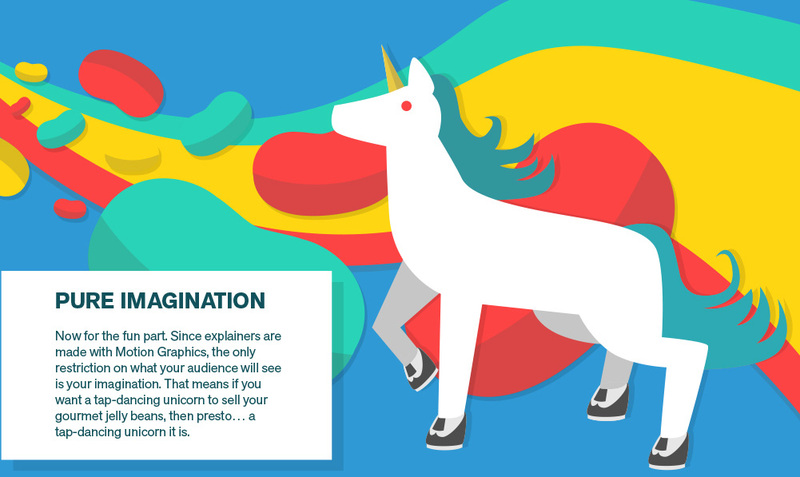 That means if you want a tap-dancing unicorn to sell your gourmet jelly beans, then presto… a tap-dancing unicorn it is. Of course, you can keep it professional – and super entertaining. With customized motion graphics that are unique to your brand, your audience will get constant visual changes that emphasize your product benefits. 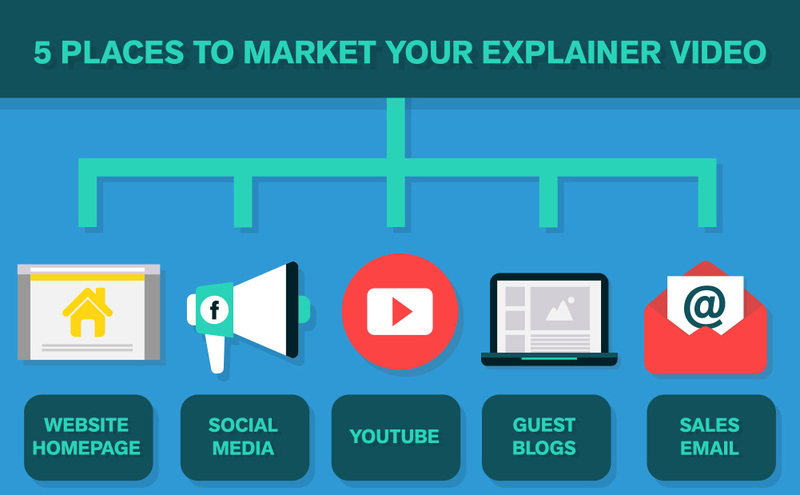 Investing in a solid explainer is one of the best marketing tools you can invest in. Not only will it help sell your product on your homepage, but you can leverage that explainer beyond the boundaries of your website. Sales Emails: Instead of sending a sea of words, email your explainer video with a pithy headline. This is a great way to showcase your product or service without bombarding someone with a long pitch. Recipients are more likely to click on a video that is animated than one with a talking head. Social Media: Create a blog post about your product’s benefits with a link to the video and a “Get More Info” call to action. YouTube: YouTube is a powerful video search engine, so why not add your incredible explainer video here? This is a free, simple way to open more doors for customers to find you. Guest Blogs If you guest post on a blog, adding a link to your video is an easy way to share with readers what you do. Many guest bloggers will include a link to their website and a short description of their company or job, but it’s worth it to ask the blog(owner?) if you can link to your explainer. Website Homepage In our experience, we find that our research people won’t take the time to read a lengthy article or web post, but people will watch a video. ES Creative makes it easy for you to create an explainer video. After we identify your unique selling points, we’ll translate them into an exciting script. Through motion graphics, professional voiceover talent and gorgeous sound design, we’ll tell your story. If you’re ready to take your company to the next level of digital marketing, set up a free consultation today. Please take 30-seconds to watch our highlight reel.